class that graduated twenty-five, among whom were Gens. U. S.
Grant, George B. McClellan, William B. Franklin, William F.
and after the Kansas troubles were over he accompanied Gen.
through such a fire as has rarely been encountered in warfare. operations of the army in Virginia under Lieut.-Gen. Grant." men, and continued in the discharge of that duty until Feb.
the fifth military district, comprising Texas and Louisiana. committed in battle a blunder for which he was responsible. David Jordan's WINFIELD SCOTT HANCOCK is an extensively referenced, solid, immensely readable biography and work of popular history. Jordan obviously thinks highly of the man. 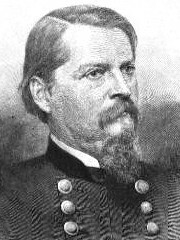 Even Hancock's less than illustrious stint as commander of the Military Department of the Missouri from August 1866 to August 1867, during which he stumbled around the Great Plains without a clue as to the nature and culture of the Indian tribes he was tasked with controlling, goes pretty much 'uncriticized.' After all, Hancock was only following the orders of his superior, General Sherman. And that's what Winfield did best all his life - follow orders. For those who would want to learn more, he lists several extensive and acclaimed biographies of "Hancock The Superb." The maps and biographical sketches included are a great aide to those without prior knowledge of Civil War figures. Jamieson tells not only of Hancock's role in the war (although he does, of course, focus on it) but also recounts his admirable postwar service on the frontier as well as his failed presidential campaign. Also of note is the mention of the history behind the most famous Hancock monuments and memorials, including both the statue atop Cemetery Hill and in Washington DC, as well as others. This book is an excellent introduction to one of the finest commanders in American military history. It combines solid research and storytelling in an effective manner and does justice to the man and his memory.